汪培庄. 因素空间理论——机制主义人工智能理论的数学基础[J]. 智能系统学报, 2018, 13(1), 37-54. DOI: 10.11992/tis.201711034. WANG Peizhuang. 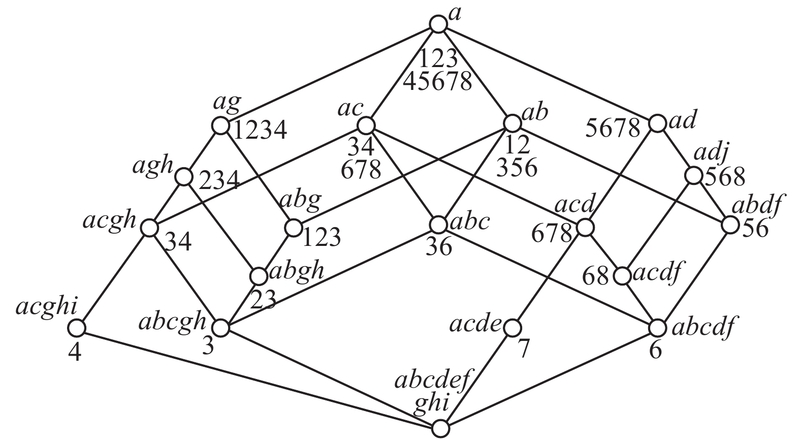 Factor space-mathematical basis of mechanism based artificial intelligence theory[J]. CAAI Transactions on Intelligent Systems, 2018, 13(1), 37-54. DOI: 10.11992/tis.201711034. Abstract: Based on using the intelligent growth mechanism, the mechanism-based artificial intelligence theory organically unifies the structure, function, and behaviorism of three genres to form a trinity of consciousness, emotion, and reason. Factor space is the mathematical basis of mechanism-based artificial intelligence theory, which promotes mathematical branches such as formal concept analysis, rough sets, and fuzzy sets, and provides a universal coordinate framework for the description and cognition of things. Data can be represented as visual sampling points in the space and then be cultivated to form the population distribution of the background relation. Based on their relationship, concept generation and causality analysis can be performed automatically, and all rational thinking processes, such as prediction, identification, control, evaluation and decision making, can be performed by factorial algorithms. In this article, we focus on ways to describe formal information (i.e., grammatical information), predict utility information (i.e., pragmatic information) from formal information, and correlate them to generate abstract semantic information, which is helpful for mathematically describing the first established law of information transformation in mechanism-based artificial intelligence theory. We also use factor space theory in chess Tic-Tac-Toe to demonstrate how to dock the target and chess factors, which may provide a clue for how to mathematically describe the second law of information transformation. We also provide a brief history to help readers gain a more comprehensive understanding of the factor space theory. 表 1 科教电影“生物与水”的背景 Tab. 1 The background of science and education film "biology and water"
表 1 科教电影“生物与水”的背景 Tab.1 The background of science and education film "biology and water"
图 3 “生物与水”的‘概念格’图 Fig. 3 The concept lattice of "biology and water"
 何华灿. 泛逻辑学原理[M]. 北京: 科学出版社, 2001. 汪培庄. 因素空间与因素库[J]. 辽宁工程技术大学学报: 自然科学版, 2013, 32(10): 1297-1304. 汪培庄, 郭嗣琮, 包研科, 等. 因素空间中的因素分析法[J]. 辽宁工程技术大学学报: 自然科学版, 2014, 33(7): 865-870. 刘海涛, 郭嗣琮. 因素分析法的推理模型[J]. 辽宁工程技术大学学报: 自然科学版, 2015, 34(1): 124-128. 曲国华, 李春华, 张强. 因素空间属性简约的区分函数[J]. 智能系统学报, 2017, 12(6): 890-894. 包研科, 茹慧英, 金圣军. 因素空间中知识挖掘的一种新算法[J]. 辽宁工程技术大学学报: 自然科学版, 2014, 33(8): 1141-1144. 曾繁慧, 郑莉. 因素分析法的样本培育[J]. 辽宁工程技术大学学报: 自然科学版, 2017, 36(3): 320-323. 欧阳合. 不确定性理论的统一理论: 因素空间的数学基础(特约报告)[C]//东方思维与模糊逻辑—纪念模糊集诞生五十周年国际会议. 中国, 大连, 2015. 袁学海, 汪培庄. 因素空间和范畴[J]. 模糊系统与数学, 1995, 9(2): 25-33. 汪培庄. 因素空间与概念描述[J]. 软件学报, 1992, 3(1): 30-40. 李德清, 冯艳宾, 王加银, 等. 两类均衡函数的结构分析与一类状态变权向量的构造[J]. 北京师范大学学报: 自然科学版, 2003, 39(5): 595-600. 李德清, 李洪兴. 变权决策中变权效果分析与状态变权向量的确定[J]. 控制与决策, 2004, 19(11): 1241-1245. 李德清, 崔红梅, 李洪兴. 基于层次变权的多因素决策[J]. 系统工程学报, 2004, 19(3): 258-263. 余高锋, 刘文奇, 李登峰. 基于折衷型变权向量的直觉语言决策方法[J]. 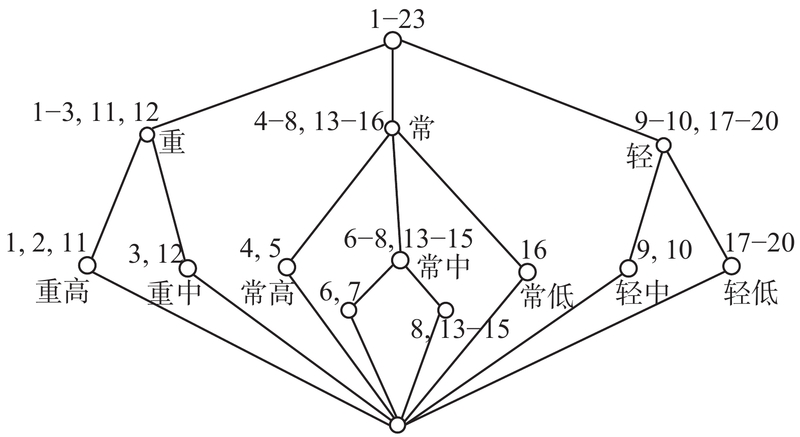 控制与决策, 2015, 30(12): 2233-2240. 余高锋, 刘文奇, 石梦婷. 基于局部变权模型的企业质量信用评估[J]. 管理科学学报, 2015, 18(2): 85-94. 岳磊, 孙永刚, 史海波, 等. 基于因素空间的规则调度决策模型[J]. 信息与控制, 2010, 39(3): 302-307. 何清, 童占梅. 基于因素空间和模糊聚类的概念形成方法[J]. 系统工程理论与实践, 1999, 19(8): 99-104. 米洪海, 闫广霞, 于新凯, 等. 基于因素空间的多层诊断识别问题的数学模型[J]. 河北工业大学学报, 2003, 32(2): 77-80. 崔铁军, 马云东. 连续型空间故障树中因素重要度分布的定义与认知[J]. 中国安全科学学报, 2015, 25(3): 23-28. 崔铁军, 马云东. 因素空间的属性圆定义及其在对象分类中的应用[J]. 计算机工程与科学, 2015, 37(11): 2169-2174. 崔铁军, 马云东. 基于因素空间的煤矿安全情况区分方法的研究[J]. 系统工程理论与实践, 2015, 35(11): 2891-2897.